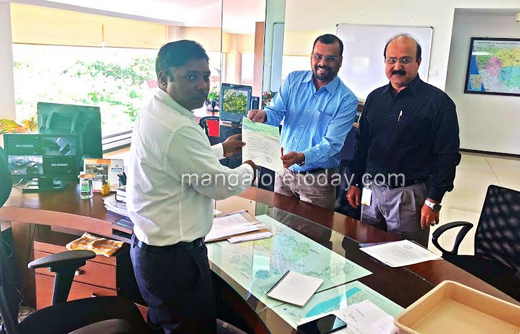 Mangaluru, Nov 01, 2018 : City based IT solutions company Semnox Solutions Pvt. Ltd., has contributed Rs. 5,12,000 to the Chief Minister’s Calamity Relief Fund in an effort to reach out to the victims of the recent floods in Kodagu district. The amount was handed over by cheque to Mr. Sasikanth Senthil S., Deputy Commissioner of Dakshina Kannada district by the company’s Managing Director Mr. Iqbal Mohammad and Chief Financial Officer CA M. N. Pai when they called on him at his office on Wednesday, 31st October. The amount was raised from voluntary donations from individual employees, to which the Company added its own contribution as a part of its corporate social responsibility effort, said the company’s press release. Semnox Solutions Pvt. Ltd., builds holistic IT solutions for the entertainment and leisure industry. The company’s products help to automate key processes and manage them centrally. Semnox’s Solutions are acknowledged by industry leaders and the company is active in 1000+ sites across 40+ countries. Parafait, their product suite, has won the ‘Innovative Product of the Year’ award at successive annual IAAPI Conferences in 2009, 2013, 2014, and 2016. The company’s city offices are located at Punja Building in Ballalbagh.